Born in 1932 in Tel Aviv, 3 years before my mother. Most artists of that generation immigrated to Israel. Born to Bilha and Ben Zion, pioneers who settled in the Galilee, where Jesus walked on water. At 15 his father died, and Kadishman became a shepherd in a Kibbutz and started sculpting and painting. He got to see a lot of sheep on the job and started painting them. He became particularly good at painting sheeps' eyes and literally sold thousands are these canvases. An installation of a herd of live white sheep, which Kadishman painted with a blue stripe on the back, was the talk of the town in Venice during the Biennale of 1978. Blue and white are the colors of the Israeli flag. In the early 60's studied sculpting in London with Anthony Caro who was later knighted for being awesome. While the sheep paintings were his bread and butter, sculpture is his passion, and most of his sculptures are large scale. Kadishman divorced, has two children, his son Ben is a painter..the apple doesn't fall far from the tree. His daughter Maya an actress, married to artist Eran Shakin, a real rebel, who is refusing to follow in his father in law’s footsteps and instead mainly paints goats. The 2005 film ‘The Blue Lamb’ was made about Kadishman’s life and work. It shows his monumental sculptures being fabricated out of huge sheets of metal in a giant industrial hanger. Clothes are redundant to Kadishman. During my visit at his 4 story studio, he wore nearly nothing, and walked around in a light white linen shirt and his underwear, no pants. He is a friendly chap who enjoys being a celebrity. While sitting in a Tel Aviv cafe he might draw a quick black and white caricature of you, sign it with a dedication, and give it to you for free. If you ask him to dedicate a painting you bought from him, he would do it with delight!. Kadishman is a giver. If he makes a bundle of money, he would give it away to his grandchildren. On the other hand, he is not planning to pay the city of Tel Aviv the property taxes he owes them. Menashe Kadishman (Hebrew: מנשה קדישמן; August 21, 1932 - May 8, 2015) was an Israeli sculptor and painter. Kadishman artworks are presented in central locations in Israel, such as Habima Square and his paintings can be found in many different galleries in Israel. He is most famous for his metallic sculptures and colorful sheep paintings. 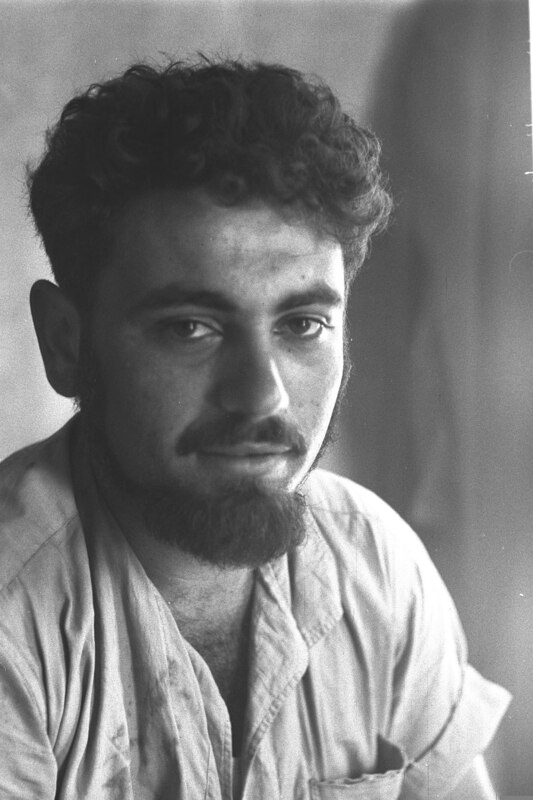 Kadishman was born in the British Mandate Palestine in 1932. His father, who was a pioneer, died when Kadishman was 15 years old. The young Menashe left school to help his mother with housework and to earn money. From 1947 to 1950, Kadishman studied with the Israeli sculptor Moshe Sternschuss at the Avni Institute of Art and Design in Tel Aviv, and in 1954 with the Israeli sculptor Rudi Lehmann in Jerusalem. In 1959, he moved to London, where he attended Saint Martin's School of Art and the Slade School of Art. During 1959 and 1960 he also studied with Anthony Caro and Reg Butler. He remained here until 1972; he had his first one-man show there in 1965 at the Grosvenor Gallery. His sculptures of the 1960s were Minimalist in style, and so designed as to appear to defy gravity. This was achieved either through careful balance and construction, as in Suspense (1966), or by using glass and metal so that the metal appeared unsupported, as in Segments (1968). The glass allowed the environment to be part of the work. Kadishman lived and created in his house in the city center of Tel Aviv. Kadishman was divorced, has 2 children. His son, Ben, is also a painter and his daughter, Maya Kadishman, is an actress who is married to the artist, Eran Shakine. On May 8, 2015 Kadishman died after he was hospitalized at Sheba Medical Center in Tel Hashomer. Check out the full Wikipedia article about Menashe Kadishman.